COLORADO SPRINGS, Colo. — When Gregg Popovich went in search of a college after graduating from Indiana’s Merrillville High School in 1966, it didn’t take him long to settle on the Air Force Academy. He wanted a place with a sterling academic reputation that also would give him a chance to play college basketball. The academy offered both. And, Popovich admits it now: The brochure also looked nice. Popovich was dismayed to learn, not long into his freshman year on the Colorado Springs campus, that ski season more or less coincides with basketball season. “That was pretty dumb on my part,” Popovich said. This week, the venerable and often irascible Spurs coach was back on his old stomping grounds, and back in his element, leading his team through the start of an NBA training camp that at times has taken on the tenor of a family vacation. Players spent one morning navigating a military obstacle course. On another, Popovich guided the team to a favorite lookout point perched atop the sprawling academy complex at the base of the Rocky Mountains. At lunch Thursday, the Spurs watched cadets parade into the dining hall, with players and coaches snapping pictures and capturing video, before sitting down to dine with them as guests of honor. All the while, Popovich has had a smile perma-plastered on his 64-year-old face. There’s little question that Popovich’s 17th training camp as an NBA head coach also has been his most special. After a Wednesday night scrimmage at Clune Arena, open to all cadets, Popovich joined a group of them in singing “The U.S. Air Force,” the official song they all learned as freshmen. Popovich has won four NBA championships, more than all but four other coaches. He’s the league’s winningest active coach and, entering his 18th season at the helm of the Spurs, is the longest-tenured active coach in professional sports. The seeds for all of the above were sewn in the even-higher-than-mile-high air at the Air Force Academy. 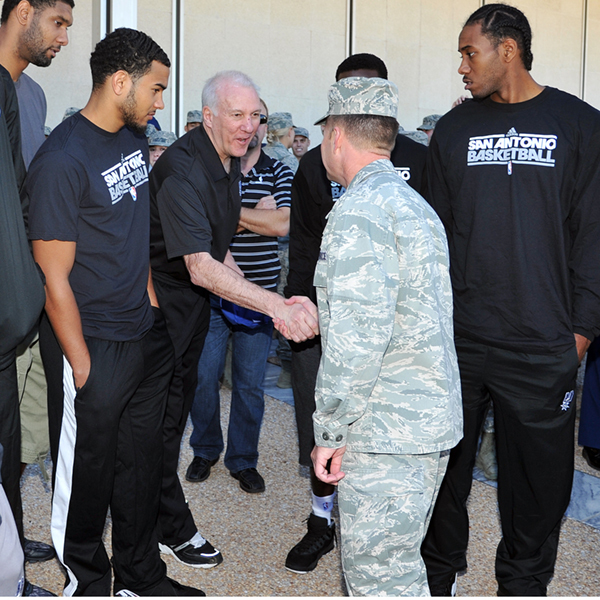 Popovich had neither a military background nor military aspirations when he enrolled at the academy. He just wanted to play basketball, and had no other offers. “There were no Division-I teams that knew my name,” Popovich said. Much of the person and coach he would become was first forged on a tree-speckled, 18,500-acre compound shadowed by Pikes Peak. Here, Popovich lived by the Cadet Honor Code, and built discipline one day at a time on mandatory pre-sunrise marches to breakfast. He graduated with a degree in Soviet studies in 1970, but wouldn’t necessarily call himself a model cadet. Whatever Popovich’s status as a cadet, Gen. Michelle Johnson, superintendent of the Air Force Academy and the highest-ranking officer on campus, says the coach has become a model graduate in the years since. The two chatted briefly before the cadets’ lunchtime march. On the basketball court as a cadet, Popovich learned at the feet of coach Bob Spear and his assistant, Hank Egan. Egan would go on to become one of Popovich’s early assistants in San Antonio, and Popovich still credits him as an integral part of the Spurs’ championship pedigree. The first coaching job of Popovich’s Hall of Fame-bound career, meanwhile, came at the Air Force Academy Prep School in 1972. From site to site and practice to practice this week, Popovich’s players have had little trouble picturing their cantankerous coach as a fresh-faced cadet more than four decades ago. Since the Spurs’ arrival late Monday, Popovich has reveled in the chance to share a bit of his past with his players. With the week coming to an end, and the Spurs preparing to break camp and head home after a midday workout Friday, players are hopeful they can convince the kinder, gentler Air Force Pop to return with them. “Hopefully this puts him in a good enough mood to last a while,” Bonner said.